The cool thing about having a blog is the ability to reach people, who live in cities, towns, hamlets, and godforsaken hell holes, who share your interests. Yes, there are always people in New York City who are cool and cutting edge and share your interests, but really, if you live in NYC it is kind of a requirement. Those people just love to pat themselves on the back for beings so hip and "withit' but truth be told, there are way-cool people in every corner of the universe. Unfortunately, we don't always hear about them until it is too late. Take June Fore Shaw. Here is a woman we wanted to party with. All those years she was just up the road in Birmingham, a fellow Pisces, a Yellow Dog Democrat right there, just ready for us to meet and we never did. On July 15, Dr. June Fore Shaw of Birmingham ended her lifelong fight against conventionality. Her loved ones are fairly certain of two things: she was ready, keys in hand, the night before, and, that when she screeched up to her final destination in her royal blue Porsche, she demanded to speak to the woman in charge. June was born in 1930 to Wilna Hicks Fore and Claude Harvel Fore, police chief of Montevallo and later sheriff of Shelby County. As a child, she and her brother loved to hang around the county jail in Columbiana for "fun." As a teenager, she adopted dungarees as her all-time favorite apparel. When she eloped at the age of 16 with a local young man nearly a decade older, her parents were downright distraught. That first marriage, like numbers two and three, didn't last long, but it did produce one adored daughter. As a determined single mother, she enlisted her parents in the care of her toddler and enrolled in college. She then astounded them by declaring her intentions of becoming a physician, going on to graduate from the University of Alabama College of Medicine in 1960--with only a handful of other women--and completing residencies in both clinical and anatomical pathology. At the height of her career, publishing prolifically, she was the director of both the blood bank and the tissue-typing lab at the University of Alabama Hospitals in Birmingham and was a founder of the American Association for Clinical Histocompatibility Testing. All this, and sitting atop her desk in miniskirt and go-go boots, she lectured to med students too. The drive that propelled June through her medical career was equaled only by her passion for what she believed in. Of course, there were her less weighty interests: her 1964 Ford Mustang and her 1970 911S; competitive tennis, through which she met her dearest friends, Della Huber and Melinda Powers; music of all kinds, but particularly the Grateful Dead; late-night games at the pool hall; and then, when she had more physical constraints, duplicate bridge. But what June most strongly cared about were justice and compassion for all humankind, and especially the rights of women and minorities in the white man's world. She was known for clearing out many a holiday table arguing impatiently over just these matters with her brother and male cousins. As an early member of NOW, a proponent of the ERA, and a self-proclaimed Yellow Dog Democrat, she would have been elated at our prospect of another chance to vote for Hillary Clinton. Though she grew feeble after surviving a stroke and, more amazingly, pancreatic cancer, she continued to play bridge and read mysteries as long as she could. Toward the end, she lived as comfortably as she did because of the unwavering care she received at Greenbriar at the Altamont, supplemented by the special attention of her longtime friend and devoted caretaker, Alinda Miller, who had a gift for helping out when June was being her prickliest self. But for the last tender ministrations, it was New Beacon hospice nurse Josie Millican who eased her peacefully on to her next destination. 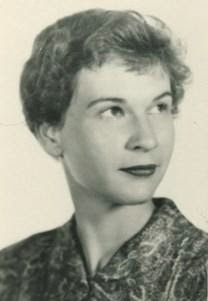 In awe of her fiercely independent and sometimes outlandish life, June leaves behind: daughter Trinket Fore Shaw (Joellyn Beckham); brother Claude Harvel Fore Jr.; niece Sharon Fore Napier and nephews Claude Fore III and Kevin Fore; cousin Lyn Wood Loyd; and a host of amazed friends and bewildered strangers with whom she crossed paths over the decades. We're certain that she would be the first to suggest that we skip the church service, throw on our jeans, and begin the eating and drinking. Please join us for that celebration on Saturday, July 26, at 11:00 a.m. at the family residence in Forest Park. June loved flowers, but would have also loved donations to your favorite nonprofit or her favorites, the Alabama Symphony Orchestra and the Greater Birmingham Ministries. Reading about Dr. Shaw, I couldn't help but think of another Pisces, Liza Minnelli. Once upon a time, she heard a story about a woman who lived in a large apartment building in New York. She told the story to John Kander and Fred Ebb and they turned it into a show stopping song for her review, Liza With a Z. The song was "Ring Them Bells." It's about a women who can't find love in NYC, so she gathers her savings and goes on a European vacation. In the unlikely locale of Dubrovnik, she meets the man of her dreams. As fate would have, he had been her next door neighbor for years. Well, I don't care that much about love, but do love a good partner-in-crime. As Liza tells us, they might be next door, or in the grocery line, or walking their cat, or sitting alone at a cafe in Denver or Decatur or even Dubrovnik. Introduce yourself. Say hello. Yes, they might think you are crazy. Yes, they might be a serial killer. But maybe, just maybe, they might be June Fore Shaw and think about how much more fun you life would have been if you had only known her. What a Gal!! Thanks for the introduction to a one-of-a-kind. Amen. Or, as should be said, A woman! What an interesting post - the bio of the remarkable sounding June Fore Shaw drew me in. Quite a way to start the day.